As much as I love to call myself a birder, my most important job title is Mom. 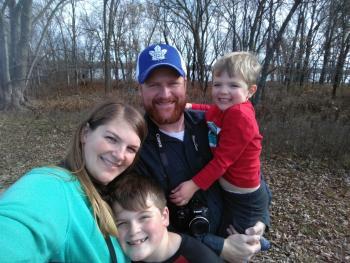 Being a Mom who likes birds has its own unique set of challenges, and, in my experience, the world of birding seems to have many more men in it than women. Most of my Kansas birding friends are men or older women, for whatever reason. I think a lot of it comes down to priorities. As moms with little kids at home, we probably tend to see many of our responsibilities as more important that birding. It&apos;s rather hard to justify driving across the state to see a rarity when you still don&apos;t know what you&apos;re going to make for dinner, after all. At the fall meeting of the Kansas Ornithological Society, I was one of very few mothers of younger children in attendance. Coincidentally, that was the first KOS meeting that I was able to attend, since I typically couldn&apos;t travel to overnight locations because I didn&apos;t have childcare. This particular meeting was in Lawrence, Kansas, which was close enough that I could drive there and back in the same day. 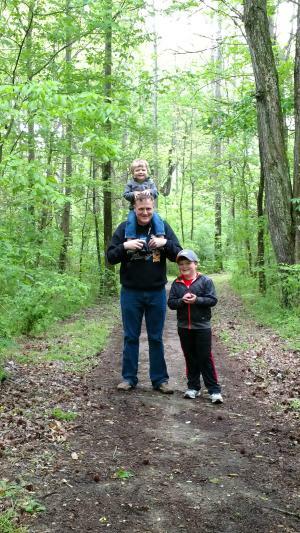 I bribed my husband to stay home with the kids (even though he likes birding, too.) So how do I make it work? I believe that there is a way to balance being a Mom and being a birder, and I think there are plenty of reasons to try and make it work. I also know that some days, you just can&apos;t. I&apos;m hoping that by sharing my story with other moms of young children, maybe we can increase this demographic in the Kansas birding community and beyond. Tip #1: Bird with your kids. I often take my children with me when I go birding. While this definitely has its limitations (who wants to go hiking with a 3-year old?! ), it is still possible. We love winter, because waterfowl are easy to view from the car in many locations. Kansas has many large reservoirs that make this easy. 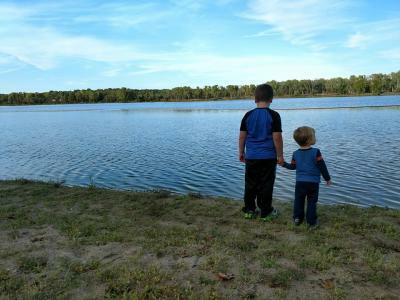 We also love summer, because we can go birding at a state park and then take a playground break to keep the kids happy. My kids actually like going birding, at least to an extent. They especially love opportunities to see big birds (like pelicans and eagles) or large groups of birds (like flocks of geese and ducks). Binoculars are challenging for kids, so finding easy targets for them to see can help get them interested. I&apos;ll never forget the day I took my kids with me to look for the Roseate Spoonbill seen near McPherson, Kansas (Spring 2017). It was found by some other birders that morning, but you had to hike into the middle of the weeds to see it. I debated giving up, but I decided to just go for it. I held Big C&apos;s hand (age 6) and threw Little S (age 1.5) up on my shoulders. We hiked through weeds and grass that were taller than Big C, but we made it. We could see it but it was pretty far away, and C was unimpressed. Suddenly, it took flight and flew a big circle all the way around us. C watched it fly over us in awe, and ever since that day, he&apos;s always been willing to go birding with me. Tip #2: Bird while visiting Grandma. I usually try to sneak away for a bit without the kids when I go visit my parents. If you find yourself somewhere with built in childcare, take advantage of it! There are literally birds everywhere you go. Ask your parent/friend/whomever to watch your kids for a little while so you can go check out the birds. You obviously have to be careful not to overuse this method, but it is really helpful when used wisely. If your spouse likes to bird, you can call it a date and get a little time alone together doing something you enjoy. Figure out what locations (lakes, back roads, wildlife areas) are decent little getaways near relatives that you visit. You never know when you might find something unexpected, but even if you don&apos;t, I promise even the regular little birdies you see will give you enjoyment. Tip #3: Pay a babysitter. For obvious financial reasons, this option can only be used as often as your life situation allows. It is, however, totally worth it. My husband and I both took a day off of work once to visit Cheyenne Bottoms & Quivira National Wildlife Refuge near Great Bend, Kansas during the spring migration. We dropped C off at daycare for the day and hit the road. It was a couple hours out there and a couple hours back, and we managed to get it all done during the hours the daycare was open. It was an awesome day spending time with my husband, and that was my first trip to that area so I saw all kinds of birds I&apos;d never seen before. That day play a pivotal role in my love for birds, and it was worth every penny I paid the daycare and every hour of PTO I used without a doubt. Occasionally you just need to do what it takes to get away. Tip #4: Chase local so you don&apos;t feel deprived when you can&apos;t go far. Kansas is a great location for rare bird sightings, and sometimes they&apos;ll be near where you live. Many times, however, they&apos;ll be hours away. When they are close enough for you to chase, forego the laundry/dishes/fill-in-the-blank chores, and go see them! If you do, you won&apos;t feel like you "never" get to chase. I&apos;m obviously not headed 4 hours to western Kansas to chase a rare bird until my kids are older, but the occasional times I give in to the local chase seem to keep my satisfied to only dream about the others. There are occasionally things you can&apos;t get away from, but if it&apos;s possible, just do it! Tip #5: Don&apos;t get discouraged when you can&apos;t go. The fact of the matter is that sometimes you just can&apos;t get out: your child is sick, you have parent-teacher conferences at school (I&apos;m the teacher, so I definitely can&apos;t skip! ), you have a family obligation, and the list goes on. It&apos;s going to happen, so we might as well make peace about it. Peruse the Kansas Birding Facebook Group and bird vicariously through the posts you find there. Spend some time studying your field guide to prepare yourself for a future birding adventure. Read through the Birds of Kansas book to figure out when you can expect certain species to be migrating through your area. Listen to bird calls to try to help better your ability to identify birds by sound. There are many other ways to enjoy the hobby without leaving your living room. Learning to enjoy these aspects of birding will not only help keep you from getting discouraged, they will make you a better birder! Tip #6: Bring the birds to you. This final tip also helps with those times that you can&apos;t get away. An easy way to bird with kids is to do it in your own backyard. Kansas has a great variety of birds that will come to your feeders. We intentionally chose a yard that would have birds based on its habitat when we moved this last time. I know that I end up having to stay home a lot, so I wanted to be able to enjoy the birds on those days, too. Invest in some high quality bird feeders and seed, make a cup of coffee, sit in your PJ&apos;s, and watch the birds out the kitchen window. Bring your binoculars in so you can see the birds up in the trees. Invite a friend over and teach them about the birds. Let the kids have fun trying to identify the common backyard birds they see on a regular basis. Another plus to this is that you can do it in pretty much any weather, from dawn until dusk, at any time of year. If you are a young mom reading this and you are interested in birding, hopefully these tips can help you navigate the complexities of birding in your life. It is definitely doable if you are willing to be a little bit unorthodox in your planning, and it&apos;s worth every bit of the stress it takes to make it come together if you see a lifer or even if you just get a little rejuvenation for your spirit. Jess was born and raised in rural Iowa in an outdoorsy and landed in Kansas via her role as an Army spouse to her husband, Brad. Though her family is no longer affiliated with the military, they've decided to stay in Kansas to raise their family, which includes two sons. 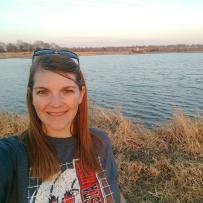 Jess developed her love of birds slowly over the course of her life, but it was her first experience with American Avocets and a trip to Cheyenne Bottoms that really cemented birding firmly as a major hobby. She also loves exploring new places in Kansas and meeting new people. For nine months out of the year, she works as a 6th grade technology teacher at Tonganoxie Middle School.